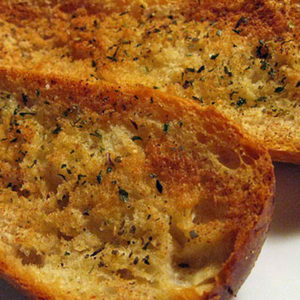 Want to make the easiest and best garlic bread? Every guest loves it. A stick of butter, softened. A few cloves of garlic minced up. Mix the garlic and butter together. Smear that onto each side of a baguette that’s split in half horizontally. Sprinkle on some freshly grated Parmesan cheese and bake it at 400° for about 10 minutes. Cut the halves into slices and watch them disappear. Somehow, garlic bread goes with everything.